MobBase Gains Traction with 50+ iPhone Apps « .Evolving Music. « Dredg Invites You to Remix Their Song and Win Big!
. Closed Tags: Apple, artist iPhone apps, Bret Bollinger, Charles Feinn, Controlled Substance Sound Labs, Everclear, IODA, iPhone Apps, iTunes, Jump Smokers, mixmatchmusic, MobBase, Pepper, Rebelution, Red Bull Records, RX Bandits, Sargent House, Silverback Music, SMC Recordings, the Jacka, Town Thizzness, Vanguard Records, Welk Music Group. Some great news straight from the MixMatchMusic garage (aka HQ)! MobBase is proving the market for iPhone applications that connect musicians with their fans, with more than 50 applications launched since the service debuted this past November. MobBase is the new service that makes it easy for musicians and music companies to create, launch and manage their own, custom iPhone applications. 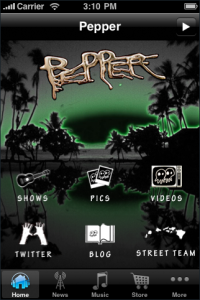 Pepper fans have installed the band’s MobBase iPhone app more than 25,000 times since the start of 2010, and have streamed Pepper’s music more than 500,000 times through the app. The Pepper app was featured in iTunes’ “What’s Hot” section in mid-January. MobBase is a low cost way for musicians to share music, photos, videos, tweets, news, information about shows, merchandise and other content with fans on their mobile devices. Bands like Everclear, RX Bandits, Rebelution, the Jacka, and Jump Smokers are finding it easy to create their own custom iPhone apps, and easy to add, manage and update content in real time through the MobBase dashboard. IODA, one of the world’s leading digital distribution companies, is promoting MobBase as its premier solution for iPhone applications. 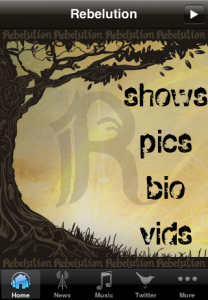 Additionally, indie labels Silverback Music/Controlled Substance Sound Labs, SMC Recordings, Welk Music Group, Vanguard Records, Sugar Hill Records, Town Thizzness, Red Bull Records, Sargent House, and 429 Records are also offering MobBase apps and are promoting it to their artists. MobBase is priced for starving artists and also artists who remember what it was like to starve, with many artists paying as little as $0.50 a day for their own app. So, start building your app today! Or contact us to learn more about how to build mobile apps. 2 MobBase Doubles Number Of Apps In Just One Month With 100+ iPhone Apps Released &laquo .Evolving Music.